You run to the store to pick up a “few” things. Only when you get back home you realize you’ve purchased twice as much and therefore spent more than double what you originally thought you would. 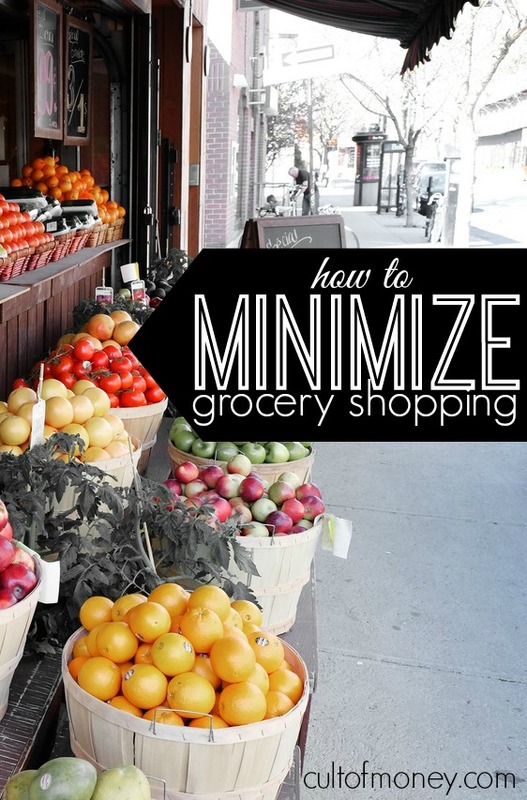 Since it takes a certain level of discipline to avoid throwing the cleverly arranged grocery store products into your cart, minimizing the amount of shopping you do is the way to go. Here’s how to minimize grocery shopping to avoid impulse purchases and save money. One thing I’ve done over the past year that has been a huge help is utilizing Amazon’s Subscribe and Save feature. With Subscribe and Save you can pick from a variety of household products and have them automatically delivered to you on a regular basis. As a bonus you also automatically save 5% on all Subscribe and Save Items and can save an additional 10% if you sign up for five or more subscribe and save items in the same delivery. There are no fees with this service and you can cancel or delay your shipments at any time. It’s definitely worth it to see if you can find the items you buy on a regular basis for a cheaper price through Subscribe and Save. If you’re into green products another service I recently tried out was ePantry. This works just like Subscribe and Save. Simply pick what products you want and how often you want them delivered. If you normally grocery shop every week try and see if you can cut that back to two weeks. Sure, initially it’s going to cost you more money upfront to buy two weeks’ worth of food at once but in the long run you’ll definitely see savings. Just make sure you have a well thought out list before shopping. Visiting the store less often means planning ahead. A good menu plan can help you stretch your food a lot further. Come up with several simple meals that everyone in your family enjoy and batch cook whenever possible. On Sundays I like to get as much food prep as I can out of the way – it makes the entire week so much easier. This includes things like dividing fruit into snack size servings for school lunches, making a big salad, pot of chili, or some other food that can be consumed when I don’t feel like cooking. As for produce one great option is to try your hand at growing your own. There’s nothing like the taste of fresh vegetables picked right from your garden. Even if you don’t have a lot of space you can do simple things like container gardening or even growing your own herbs from your windowsill. If you want your garden varieties to last all year try your hand at canning and preserving. I understand the fact that not everyone can (or wants to) grow their own food. And even if you are proactively working on this there are still several instances where you’ll need to go purchase fresh produce. Buy From the Famers Market – If you purchase produce from the famers market you won’t have to battle the temptation of the thousands of other items in a normal grocery store. Shop with a List – Shopping with a list and sticking to the list can save you money. Make your list before heading into the store, grab what you need and go. Shop at One Store – Instead of bouncing around from store to store trying to find good deals, shop at one store. More often than not finding “good deals” means buying things you don’t need and will never use. That’s wasting money, not saving it. It’s far better to just keep things simple. By simply visiting the store or logging onto Amazon less frequently you can reap significant savings, especially if you were a big impulse purchaser beforehand. By following these very simple tips you can become more organized and potentially save yourself thousands of dollars per year.